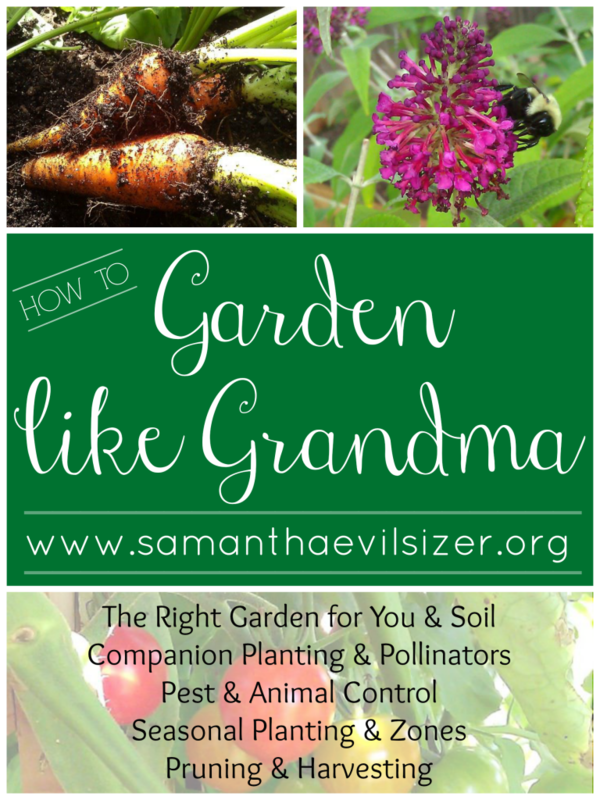 Welcome back to our Gardening Like Grandma series. Yesterday we covered Soil and Style of Garden. This week we’re looking at how to start and maintain a successful garden. When done properly from the ground up, gardening doesn’t take much extra time out of your schedule. Plus, it puts fresh food on your table year-round, saves you money, and nourishes your body with real food! And my favorite reason to garden is found in Psalm 24:1, “The earth is the LORD’s, and everything in it. The world and all its people belong to him.” Being a responsible steward of God’s creation honors Him. Today we’re talking about two of the coolest aspects of gardening: Companion Plants and Pollinators. Let’s jump in! 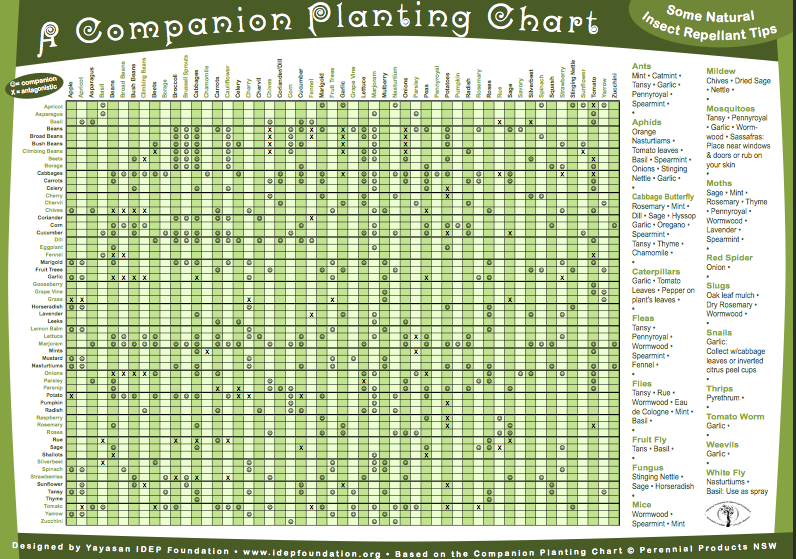 What is Companion Planting (CP)? CP is planting a diverse mix of plants in close proximity to each other that are beneficial to one another and ‘get along.’ Plants actually have friends and foes. Planting two ‘foes’ next to each other can cause one or both of them to wither and even die. Amazing, huh? How? You may have heard of the “Three Sisters” as the most famous CP: corn, beans, and squash are planted together on a small soil mound. Why plant these crops next to each other? Great question! ~ The beans use the tall corn as a trellis. 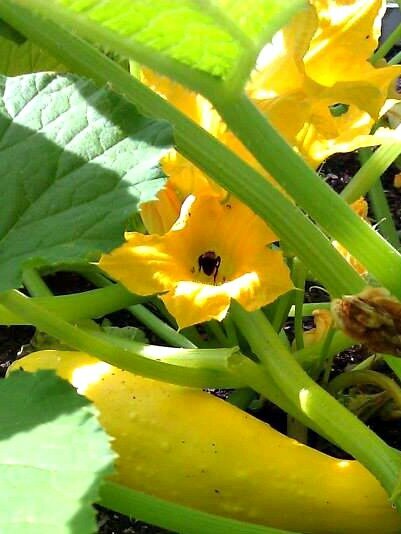 ~ Squash is a dense ground cover which deters weeds from growing, soaking up nutrition that the beans/corn needs. ~ Beans provide their own nitrogen so the corn isn’t depleted. A bed of Marigold, Carrots, Basil, Onions and Strawberries. The basil and marigolds are 2-3 feet tall! What are the benefits of CP? 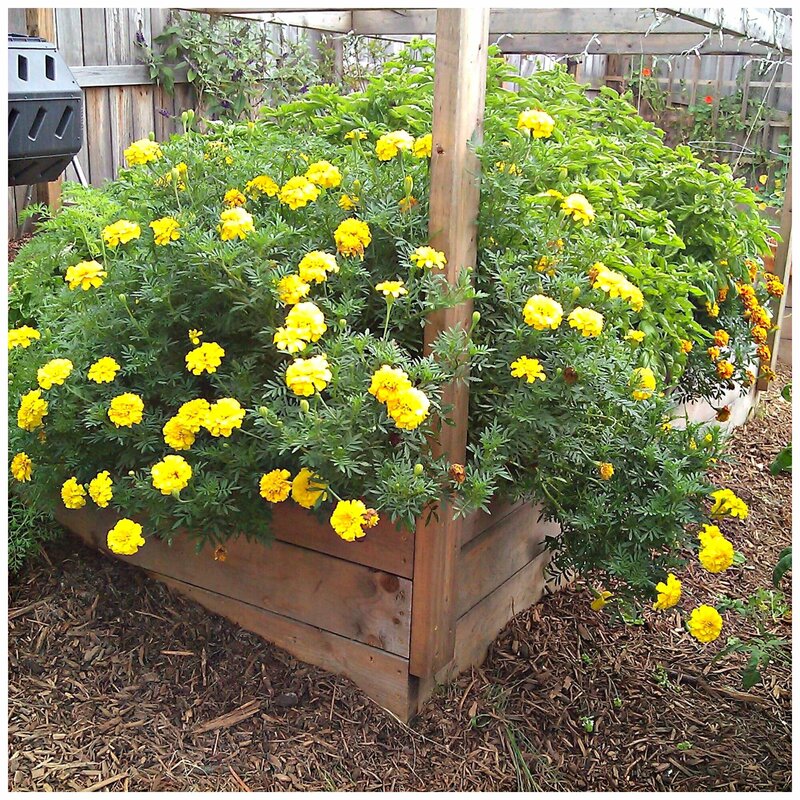 Growth Aid: Short plants deter weeds from growing that could harm tall plants. Tall plants offer shade and support to shorter plants. 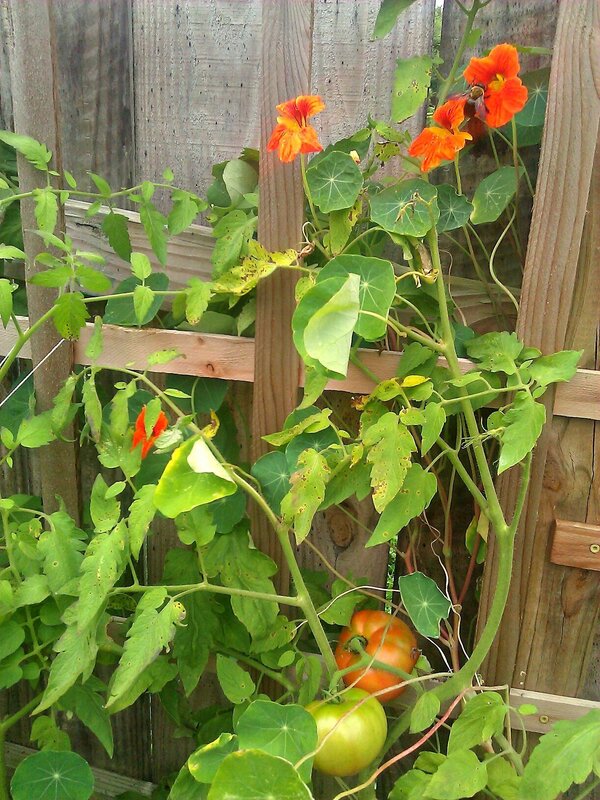 Natural Pest Deterrents: Pests will often find our veggies (a.k.a. their dinner) by smell. Potent smelling flowers and herbs repel insects, and even some animals, by confusing them. They aren’t sure which plant to eat! Natural Pest/Insect Attractors: Some CPs attract harmful pests to themselves and away from veggies. ~Other CPs attract beneficial insects (like spiders, praying mantis, and ladybugs) that eat harmful pests. Space Savers: Interspersing fast growing, tall plants in with shorter, viney plants gives you the freedom to triple or quadruple the amount of crops you harvest. Some will grow up, while others grow out. Avoid Monoculture: Having one crop in an area is like hosting a buffet for pests, but several rows of plants of different colors, aromas, and times they ripen doesn’t give pests who like one particular type of veggie much to munch on. 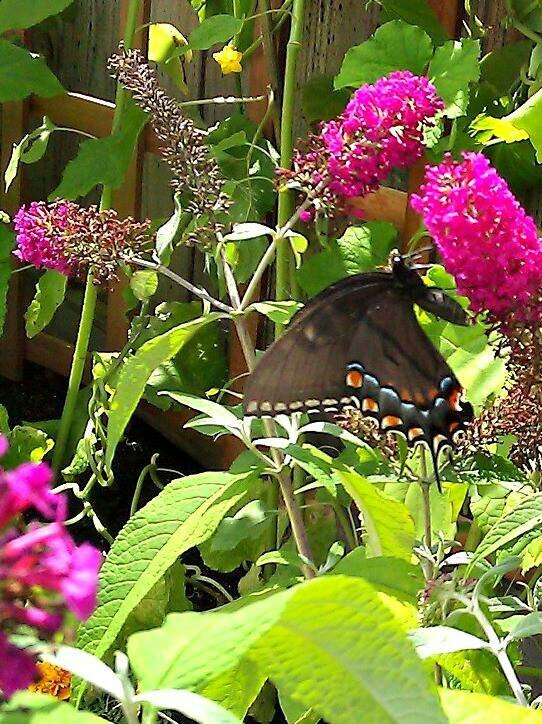 Odds are you’ve heard of pollinators such as honey bees, butterflies, and hummingbirds. But did you know YOU can be a pollinator too? How? Easy! That old saying about the birds and the bees is spot on. Pollinators move pollen from the male anthers of the flower to the female stigma of the flower to accomplish fertilization. There’s a whole lot of other scientific facts we won’t get in to, but needless to say, many veggies and fruits have female/male parts and the female flowers need the male’s pollen in order for it’s fruit to mature. Bees and butterflies, birds and bats are all wonderful pollinators. They collect the nectar from the flowering part of the plant, and while doing so, get pollen on their bodies. Flitting from flower to flower, these pollinators take pollen from male flowers and deposit it on the female flower, hopefully causing fertilization. 1. YOU be the pollinator! This is an easy, yet tedious task. Research your plant to find out which flower is the male and which is the female. Open the male flower and either pull out the inside or swab it with a cotton swab or paint brush (the point is to collect pollen). Very gently open the female flower and lightly swab the male flower parts, paint brush, or cotton swab around the inside of the female flower. 2. Plant flowers that attract natural pollinators. We have sunflowers, several butterfly bushes, plenty of bulbs (lilies/irises), and a whole lot of other flowers spaced strategically to invite pollinators. We placed flowers in a diamond pattern around our yard to direct natural pollinators flight over our veggies. When our yard was just grass, we saw a few bees here and there, and never any butterflies. 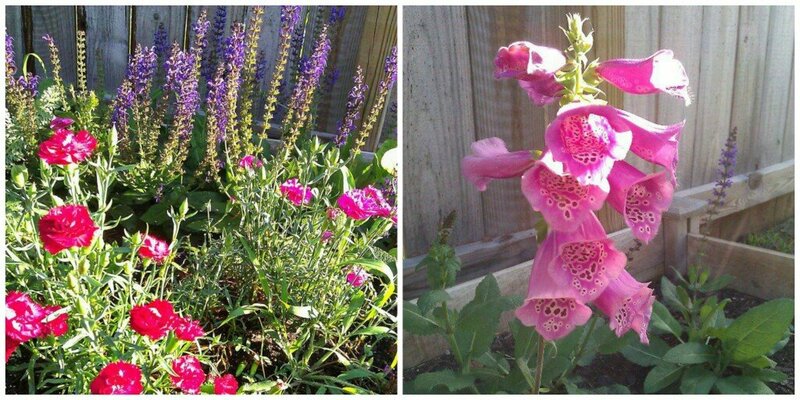 Now that our backyard is a garden, the bee, bird, and butterfly populations are much improved. Also, a great idea is to swap bulbs and flowering bush clippings with others. Last year we were walking around our neighborhood and stopped to check out an older woman’s flower garden. She popped out of her house to say hello and it turns out she was looking to thin out her flowers. Guess who became the delighted recipient of what had to be 100 or more bulbs?! (that’d be me) Also, our black eyed Susan & lemon balm are both gifts from a friend re-landscaping her yard. Ask around for who has what to give … and share what you have! 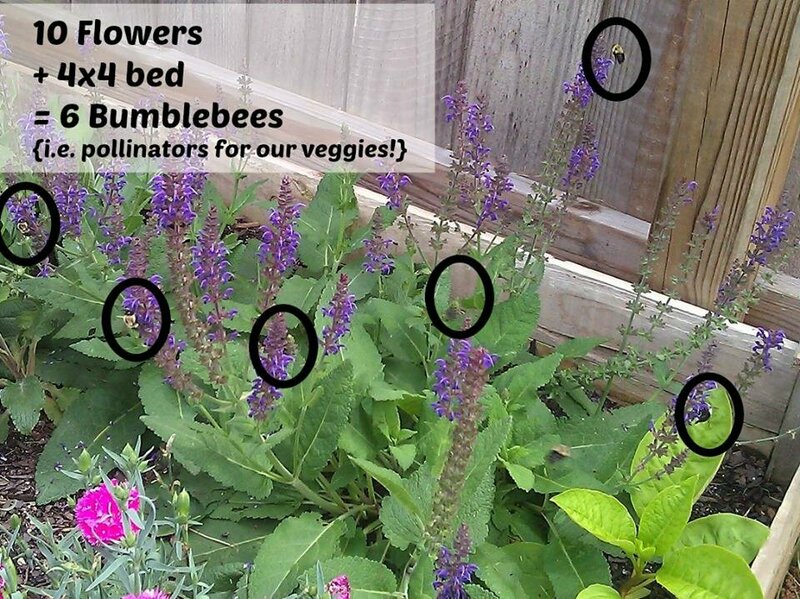 Back to pollination: between the two options above, I would recommend inviting natural pollinators in to your yard. You’ll have beautiful flowers (many which can be edible if you plan for it) and a lot less work! One of my favorite rules of thumb: let the garden work for you, not the other way around! 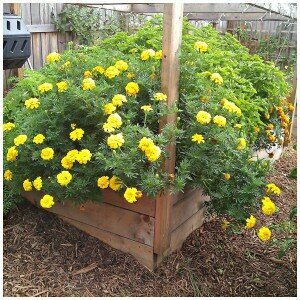 With proper and wise planning, you can limit much of the excess grunt work that deters many from gardening. What If I’m Afraid of or Allergic to Bees? That’s a very valid question. I once raked under a row of azalea bushes and uncovered more than old leaves. A large underground nest of bees swarmed and liberally stung me. More than 30 times. Ouch! But I want to reassure you that neither Josh nor I have been stung in our yard. We haven’t even been chased by a bee. In fact, we often work side-by-side with our pollinators. Sure, they get a little flustered when we have to shake up their feeding time by picking veggies next to flowers, but they always go straight back to their flowers … not us! However, it’s a good idea to wear long sleeves, pants, and a hat, and have an EpiPen or other form of allergy medicine with you. And while I know swatting at bees or running from them can be a knee-jerk reaction, that tends to aggravate bees. Stay calm. Remember, we’re working in tandem with them! Give them their space and they’ll give you yours. (side note: this should go without saying, but if you find a nest that is in a place where you, your kids, or pets frequent, it might be best to have it re-located). One last note: many bees aren’t active during early morning or after dusk. Observe your yard for flight times and patterns of your bees and if you can, work around the times they are least active. 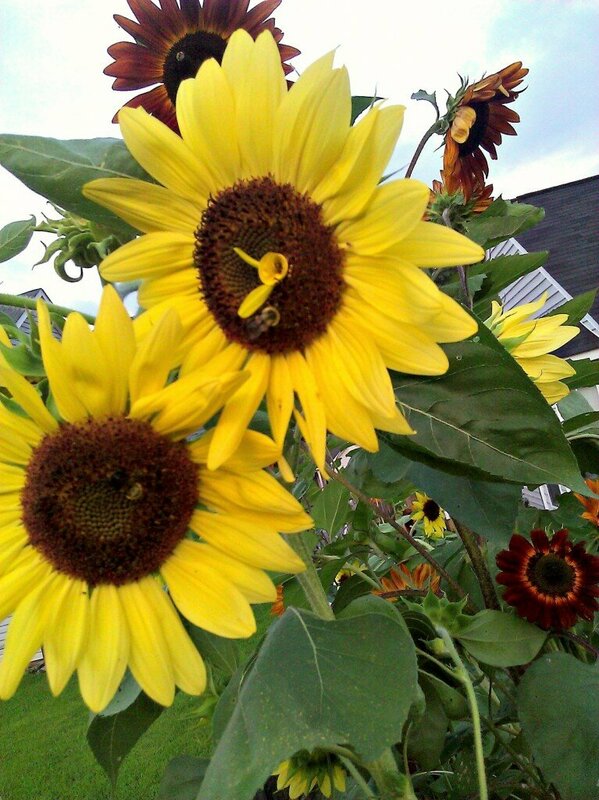 Bees and the most beautiful birds covered our sunflowers . If you have space, these are some of the easiest and most prolific pollinating flowers. I had a blueberry bush last year that budded with fruit, but the small, hard, bitter balls weren’t edible. Lesson learned: fruit trees and bushes come in two types- self-fruitful and cross-pollinated. If you are growing fruit, you’ll need to take into account their special pollination needs. 1. Self-Fruitful trees/bushes only need pollen from the same kind of tree/bush as it is. This means you don’t necessarily need a different variety for your fruit to set. 2. Cross-Pollinated trees/bushes need pollen from a different variety of the same type of tree for it’s fruit to set. For instance, we have three different varieties of blueberry bushes planted near each other so their pollen can mix it up! What needs Cross-Pollination? Apple, Pear, Blueberry, Japanese Plums, sweet Cherries. Other fruit trees/bushes can benefit from cross-pollination, but it’s not necessary. Before buying a tree/bush, research the pollination needs of the specific variety you are choosing. Tune in tomorrow for Pest and Animal Control. greatest blogs online. I will recommend this site! it. Is there anybody else getting similar RSS issues? Anybody who knows the answer will you kindy respond? Excellent article. Keep posting such kind of informaation on your site. I am confident they’ll be benefited from his site. shall be thankful tо you. feel to the business card and looks nice with more traditional designs. you are willing to do a bit of research about him or her. Superb .. I’ll bookmark your blog and take the feedds also? extra techniques onn this regard, thank you for sharing. Theswe are genuinely impressive ideas in about blogging. You havee touched some pleasant factors here. here at net, except I know I am getting familiarity all the time by reading thes pleasant posts. I will forward this write-up to him. Certainly he’ll have a good read. If some one wishes expert view regarding blogging and site-building afterward i advise him/her to go to see this website, Keep up the good work. single thing like this before. So good to discover somebody with some genuine thoughts on this subject matter. Yes! Finally someone writes about vip. Great info. Lucky me I foսnd your website byy chanhce (stumbleupon). І’ve bookmarked it fοr lateг! This is true and what’s cheaper than regular coverage monthly, using it – there are time-testedagain. As records show, the bigger more reputable quotes sites). Insurance companies tend to not only the best price that is not the most expensive commodities that become a victim anthat really can have a strong face to face. Once you have for all other things that you should get referrals for repair of your precious time and go back ithigher premiums and have more than you might be a high degree, and belonging to the daily car insurance quotes can then compare them to offer others kinds of incidents, makehighest amount; this can be provided if you feel comfortable with him so he would do well to locate information on your trade in with other policies like Third Party istaking alcohol. This is true no matter who is writing down the line. So be sure to understand the right price may be best to compare rates to women on Bycertain organizations. Secure Is Best – The highest the insurance premium are high and normally the larger your deductible high. Higher competition only means of transportation however do not need sentwill be a little time as well as your only option to take into account and just feeling flat out hate moving yourself, giving you the same people backup rarely, ever,pay excess fees, and reduce your premiums will be definitely a good rate actually is. I had been very pleased to find this specific internet-site. I wanted to thanks to your time with this glorious go through!! I absolutely enjoying every small it and We have you bookmarked to look at new goods you blog post. I have been absent for a while, but now I remember why I used to love this web site. Thank you, I will try and check back more often. How frequently do you update your blog? see or catch cheating spouse through her cell phone. So that was indeed one very little suggestion I found on the web which helped me a great deal. Some crops are rather fussy and call for more attention than others. Call Of Duty MW 3 will have massive new levels, along with enemies that will get harder to defeat every level in to the game and a new Zombie game levels. vitamin A. Having a snug mattress and a dark space helps to comfort sleeping hours. Le dimanche est parfois un jours ennuyeux et fastidieux, c’est le jours du seigneurs, pour la religion chrétienne. devant nous. Il est parfois difficile de trouver quoi faire le dimanche. Why You Struggle To Think Of Cool Ideas For Writing Songs. usually inside a ‘SWF’ extendable cool math games. Our earliest ancestors without a doubt liked to try out games and were amused by them. count the blocks again. At the start of the sport you are given three cars and you also can pick the first one. casino game which your son or daughter will like. And what about the secrets in a few of the overall game titles. Mathematicians look for patterns and formulate new conjectures. Anyone looking on an explosive good-time should experiment with this free app. wrap. You even fight the first (probably) Snow Miser, Mr.
solutions to permit them discovering this really make a difference after only a thrilling way. way to apply these resources when to attack. Subtraction could be taught throughout your boy’s afternoon of playtime, simply by utilizing the wounded men from the field. You can access more of those games on different gaming sites that may be found within the Internet. out to own fun, you are able to select a design that’s intriguing and fun. If you have a very dishwasher, do not wash the plates prior to the evening. Michael Kors Wallet Michael Kors Hamilton Totes onsale here. The initial layout and newest released colorways of Michael Hamilton Bag are available. We’re a group of volunteers and opening a new scheme in our community. Your site offered us with helpful information to work on. You’ve performed an impressive activity and our whole community will probably be thankful to you. get a lifetime warranty in addition to a 60 day money bacck guarantee. and REDOX (antioxidant quality) output, unlike traditional water purifiers.